In the ASR program's third year, we received over 470 qualifying vulnerability reports from researchers and the average pay per researcher jumped by 23%. To date, the ASR program has rewarded researchers with over $3M, paying out roughly $1M per year. The ASR program's reward averages were $2,600 per reward and $12,500 per researcher. Notifications are a powerful channel you can use to keep your app's users connected and updated. 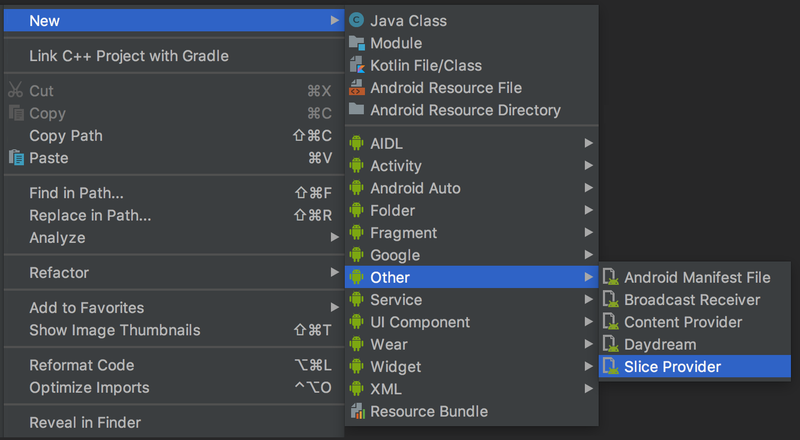 Android provides Notification APIs to create and post notifications on the device, but quite often these notifications are triggered by external events and sent to your app from your app server. In this blog post, we'll explain when and how to generate these remote notifications to provide timely updates to users and minimize battery drain. 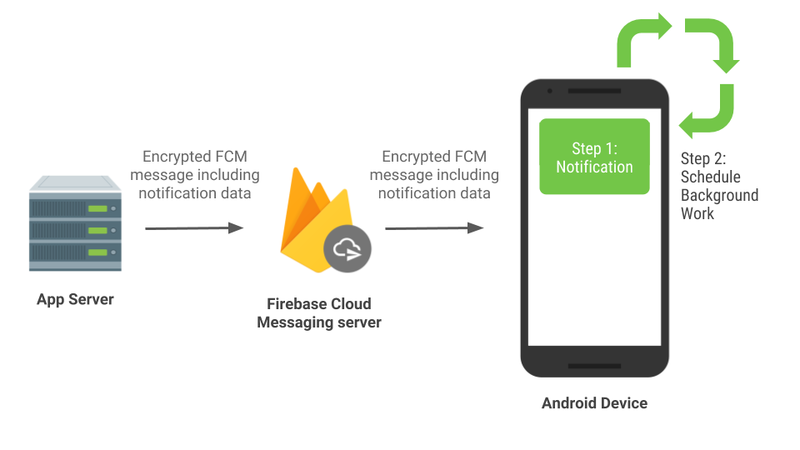 We recommend using Firebase Cloud Messaging (FCM) to send remote notifications to Android devices. FCM is a free, cross-platform messaging solution that reliably delivers hundreds of billions of messages per day. It is primarily used to send remote notifications and to notify client applications that data is available to sync. If you still use Google Cloud Messaging (GCM) or the C2DM library , both of which are deprecated, it's time to upgrade to FCM! FCM is optimized to work with Android power management features. Using the appropriate message priority and type helps you reach your users in a timely manner, and also helps save their battery. Learn more about power management features in this blog post: "Moar Power in P and the future". The When not to use a notification section of the Material Design documentation for notifications highlights cases where you should not send your user a notification. For example, a common use case for a normal priority FCM Data Message is to tell the app when there's content ready for sync, which requires no user interaction. The sync should happen quietly in the background, with no need for a notification, and you can use the WorkManager1 or JobScheduler API to schedule the sync. If you are sending remote notifications, you should always post the notification as soon as possible upon receiving the FCM message. Adding any additional network requests before posting a notification will lead to delayed notifications for some of your users. When not handled properly, the notifications might not be seen at all, see the "avoid background service" section below. 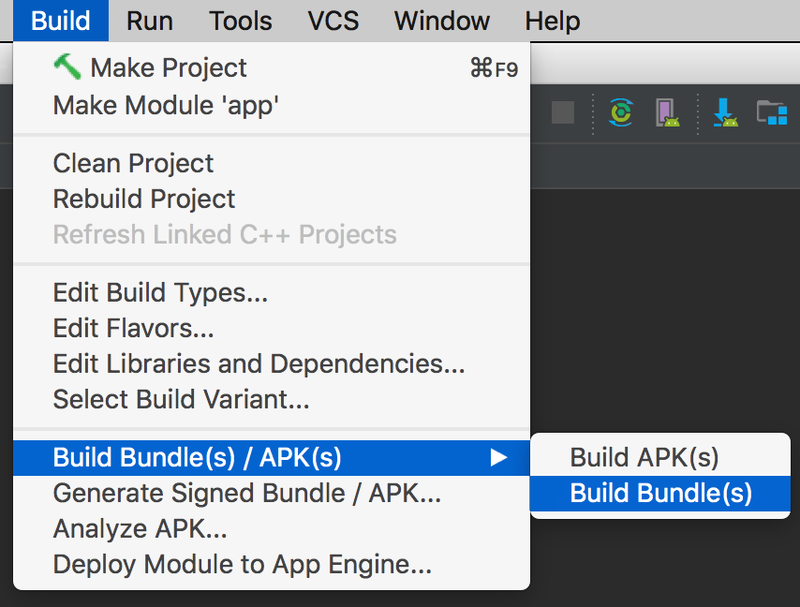 Also keep in mind that, depending on the state of the device, user actions, and app behavior, one or many power saving features could be restricting your app's background work. As a result, your app's jobs and alarms might be delayed, and its ability to access the network might be restricted. The same applies to data sync--we recommend that your app send as much data as possible in the FCM payload and, if needed, load the remainder of the data when the app opens. On a well-performing network, there's a good chance that the data will be synced by the time the user opens the app so the spinner won't be shown to the user. If network connectivity is not good, a notification will be sent to the user with the content in the FCM payload to inform the user in a timely manner. The user can then open the app to load all the data. If you need to post a rich notification, we recommend posting the notification first, with some of the content in the FCM message. Then schedule a job to fetch the remainder of the content. Once the job is finished, update the notification if it is still active. 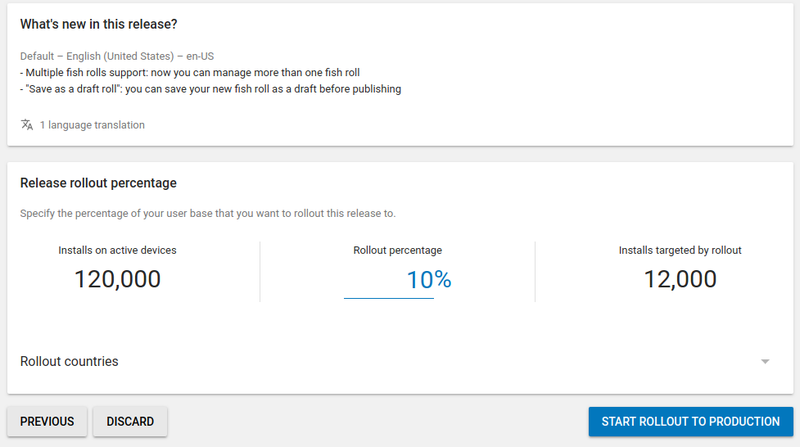 For example, you can include a thumbnail or preview of the content in the FCM payload and post it in the notification first. Then schedule a job to fetch the rest of the media files. Be aware that if you've scheduled jobs from the FCM message handler, it is possible that when the user launches the app, the scheduled job won't have finished yet. You should handle this case gracefully. 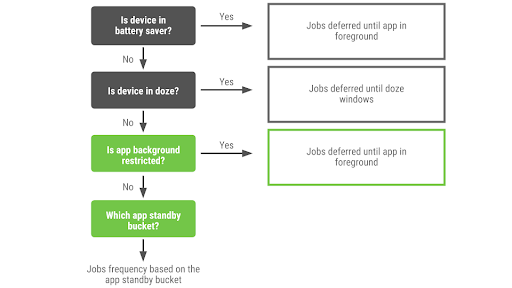 App Standby Buckets impose different levels of restrictions based on the app's standby bucket. Based on which bucket your app belongs to, there might be a cap for the number of high priority messages you are allowed to send per day. Once you reach the cap, any subsequent high priority messages will be downgraded to normal priority. See more details in the power management restrictions. However, if you use high priority messages to send notifications to the blocked notification channels or tasks which do not involve user interactions, you will run the risk of wasting the high priority messages allocated in your app's bucket. Once reaching the cap, you won't be able to send urgent notifications anymore. 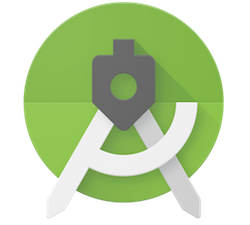 Thank you for helping move the ecosystem forward, making better Android apps, and saving users' batteries!